Why are combinatorial sets useful? There is a quick way to generate different stoichiometric combinations of elements (or vacancies) inside a common structural framework (cell) is offered in the Advanced menu of the header bar of the Materials Designer. Combinatorial sets are used to study a variety of modifications to a base structure through the substitution of elements at particular atomic positions. To this end it is possible to specify what elements are substituted for each atomic site in a structure and specify a different substitution rule for each position as well. This feature lets users create multiple materials at once using an extended syntax for crystal basis as explained below. When a study involves a screening of a large number (eg. hundreds, thousands) of different compounds (or alloys) in order to identify the ones that possess a target property with a desired technological objectives. users might find combinatorial sets to be particularly resourceful and time-efficient. The dialog features a text field where the crystal basis of the desired combinatorial set can be edited, according to the format illustrated in the forthcoming examples. During the generation, the crystal lattice parameters will be taken for the currently selected structure. Combinatorial Basis syntax is a superset of the basis representation format explained here). The characters denoting the chemical elements are separated by slashes or commas to generate "permutations" or "combinations", as illustrated in the following examples. NOTE: permutations and combinations have to be used independently and NOT within the same basis context. Vacancies can be added as part of the generated combinatorial set via the "VAC" keyword. This keyword can be inserted in the same way as an element name, and can be combined with either slashes to generate corresponding permutations, or commas for combinations (with no trailing spaces). As expected, a set of six structures is generated. Note the vacancy (missing atom) at site 0.0 0.0 0.0 in cases 3 and 4. 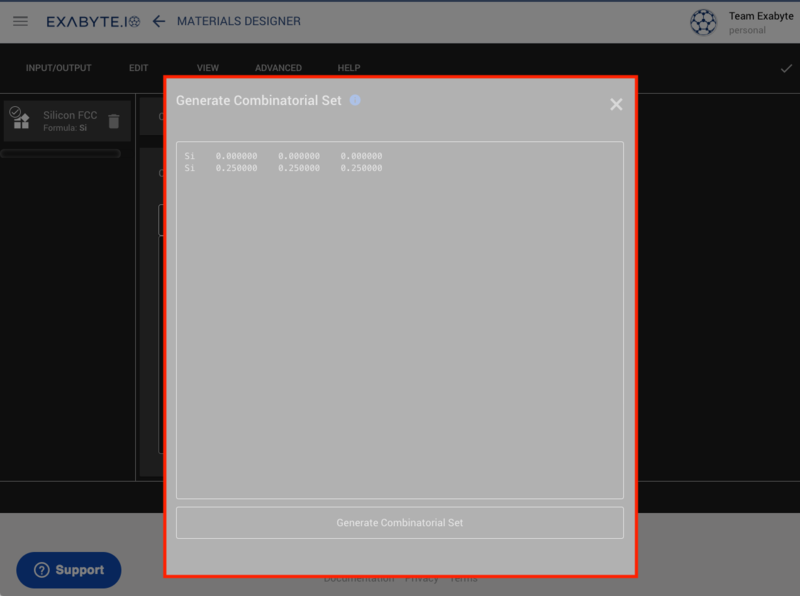 Once the text of the desired combinatorial set is entered, click on "Generate Combinatorial Set" at the bottom of the dialog of the same name, and the corresponding set of structures will appear in the list on the left-hand items sidebar of the Materials Designer interface. An example of combinatorial set generation is in the animation below. Six different combinations are generated starting from a pure silicon sample, based on alternations between the elements Si, Ge and C following the second combination example above. At the end, each resulting crystal structure is reviewed to highlight the difference in atomic composition (crystal basis) and similarity in their underlying structural framework (crystal lattice). Exabyte.io v0.17. Built in San Francisco, CA, USA.